Poinsettias are a wonderful worldwide holiday tradition. Displayed alone or in groups, they add a festive splash of color to every decor. 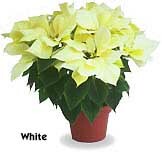 Find out about this fantastic holiday plant here, or order poinsettias and other Christmas flowers online today! A charming story is told of Pepita, a poor Mexican girl who had no gift to present the Christ Child at Christmas Eve services. As Pepita walked sorrowfully to church, her cousin Pedro tried to console her. "Pepita," he said, "I am certain that even the most humble gift, given in love, will be acceptable in His eyes." Pepita gathered a bouquet of common weeds from the roadside, for this was the only gift she could give. As she entered the chapel and approached the alter, her spirits lifted. Forgetting the humbleness of her gift, the girl laid the weeds at the feet of the Christ Child. Suddenly, Pepita's ordinary weeds burst into brilliant red blooms! This miraculous event was named the Flores de Noche Buena, or Flowers of the Holy Night. Today, we call these flowers poinsettias. Choose plants with thoroughly colored and expanded bracts. The bracts are the colorful part of the poinsettia, while the true flowers are the small yellow centers. Look for plants with dense, plentiful foliage all the way to the soil line. The plant should be about 2 1/2 times larger than its pot size. Select plants with strong, stiff stems and no signs of wilting. Be wary of plants displayed in paper, plastic or mesh sleeves, for these can reduce air flow. Place your plant in indirect sunlight for at least 6 hours per day. Provide room temperatures between 68 and 70 degrees F.
Water your plant thoroughly when the soil is dry beneath the surface. Avoid cold drafts or excessive heat. Do not expose your plant to temperatures below 50 degrees F.
Do not over water poinsettias. Poinsettias are so versatile that you never have to worry if the recipient already has one. From a centerpiece on a holiday table to a miniature plant decorating the corner of an office desk, to a colorful hanging basket that can brighten any room, the poinsettia is the perfect holiday gift. With proper care, your poinsettia can last long past the holiday season. Here's how: By early April, when the colored bracts begin to turn or fall, cut the plant back leaving 4 to 6 buds. Keep the plant near a sunny window, water and fertilize regularly, and by the end of May you should see vigorous new growth. Continue to nurture your plant as Autumn nears. For additional information and to send holiday flowers online, see Christmas Flowers and Gifts, Hanukkah Flowers, and More Christmas Flowers Favorites. You may also be interested in our Next Day Flowers, International Flowers, and Discount Flowers delivery.